85-89 Jane Street rendering. Image Credit: Steven Harris Architects. Proposal would redevelop two turn-of-the-century utilitarian building into a residence containing an elaborate garden, with a set back protruding tower containing a dining room and study. On July 12, 2016, the Landmarks Preservation Commission considered an application for the residential redevelopment of two adjoining buildings at 85 and 89 Jane Street . The two buildings fall within the Greenwich Village Historic District. Both structures are identified utilitarian in style in the district’s designation report. The building at 85 Jane dates to around 1885, originally built as a stable and carriage house, later converted to a garage and factory, the building rises to two stories. The one-story garage at 89 Jane dates to 1919. Owned by limited liability companies, Curbed reports that the buyer is thought to be Jon Stryker, philanthropist and billionaire heir to a medical supply fortune. Steven Harris, of Steven Harris Architects, presented the proposal in which the two lots would be merged, and redeveloped as a one-family dwelling. He noted that the area in which the development would take place had history of commercial and industrial architecture, and the site occupied a “liminal condition” at the edge of the historic district, with many taller buildings nearby. Harris also stated that the existing two buildings had been heavily altered throughout their history. Harris said his client was passionate about landscaping, and a portion of the combined lots would be converted to a garden, and there would also be plantings created on roofs and terraces. Harris anticipated that one million tons of soil would be brought in for the project, which would double the amount of green space in the block. At 89 Jane Street, a new two-story wall be installed above the existing garage facade, clad in buff masonry, with large steel-framed windows recalling the industrial past of the building, allowing views of the plantings behind the wall. The brick, windows, and fire escape of the original existing facades would be restores. An existing cornice would be removed, and a one-story, wood parapet screen of “charred Japanese ash” would be installed at the top of 85 Jane, creating a three-story streetwall. The ground floor of 85 Jane Street would be converted into a garage and gym. 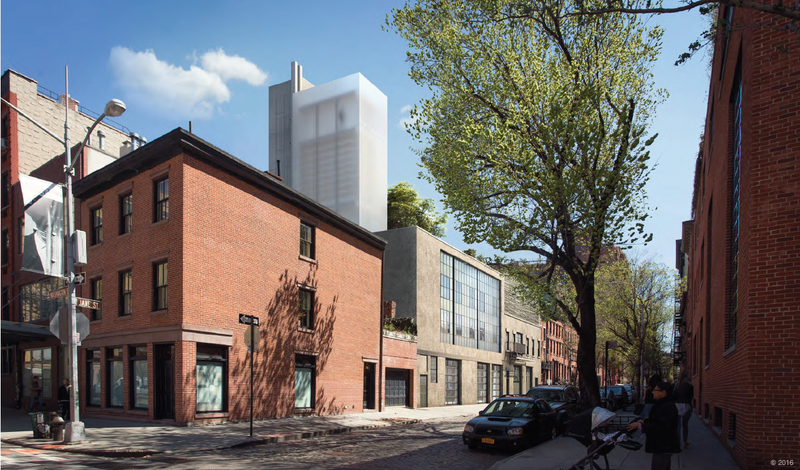 A thin tower, roughly 13 by 20 feet in width a depth would rise four stories above the street on 89 Jane Street. The tower would be composed of etched translucent glass, with an associated stair and elevator bulkhead, reaching almost four stories, clad in concrete. Harris said the tower was intended to recall the water towers and smoke stacks of the area’s industrial and commercial architecture. The tower, which would widely visible from vantages throughout the area, would house a dining room, studio, and double-height library. Harrison noted that much more bulk than the applicants were asking for was available under the site’s C4-4/R6 zoning. An attorney for the applicant stated that a 42-foor street wall was mandated by zoning when building under the Quality Housing Program. Numerous residents spoke at the hearing to testify that the proposal did not respect the character of neighborhood in scale or design, particularly objecting to the planned tower, with some condemning the impact of “mega-mansions” on the neighborhood. Cynthia Penney, of the Jane Street Block Association, argued that industrial architecture was an inappropriate vocabulary for Jane Street, where residential and commercial buildings predominated. Chair Srinivasan led the discussion among commissioners. She stated that the site presented opportunities for redevelopment, and the presentation was intriguing, but found the proposal inappropriate for its context, and said the tower did not reflect its inspirations in historic industrial appurtenances. Commissioner Fred Bland found that the proposed ensemble could be appropriate for places other than Jane Street, and that the streetwall additions would be better if they were lower and set back. Bland noted that the site could easily accommodate the desired uses, but required revision and rearrangement. Commissioner Adi Shamir-Baron found that, conceptually, the tower could be an appropriate element, but because of the decision to “pump it with program,” it lost any relationship to its cited precedents. Srinivasan did not call a vote, instead leaving the applicants the opportunity to reassess their plans and return to Landmarks with a revised proposal at a later date. LPC: 85-89 Jane Street, Manhattan (18-1551) (July 12, 2016) (Architects: Steven Harris Architects).